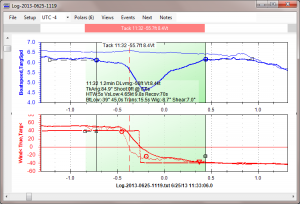 There are several things LogScanner can tell you about when you look at tacks. What does a tack look like? When you first turn up, boatspeed hasn’t slowed down yet, so the Vmg increases. As you turn away the boat slows down because the sails aren’t driving the boat yet. When you get to the new bearing, sails begin to restore boatspeed. When you achieve your pre-tack boatspeed and angle, your Vmg returns to its pre-tack value (ideally). When looking at a stripchart of a tack, you don’t use a Vmg plot because averaging hides all the detail, and the two components of Vmg (boatspeed and true wind angle), are what the crew controls, and therefore the things you need to look at. 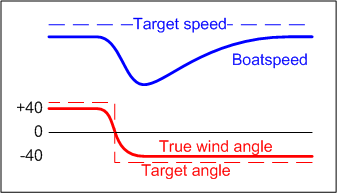 True wind angle is heading – primarily the helmsman’s job. Shear makes the wind angle larger on one tack and smaller on the other. Since this changes the sail drive, boatspeed will be faster than target on the tack with the larger angle, and slower than target on the other. Gradient raises or lowers the boatspeed equally on both tacks. Bad sail trim can also change performance in ways that look like shear and gradient. But bad trim won’t be exactly the same on every tack, so by looking at several tacks, you will probably be able to suss out whether God is messing with you or your crew is screwing up. Here’s a real tack plot. It is the first tack in our Block Island log (see LogScanner Race Analysis). Ok, real world has noise. But this tack does look pretty much like the idealized tack. Tacking angle; 85°. Point of maximum Vmg shoot; none. Head to wind; 5 seconds. Lowest boatspeed; 4.65 knots 9.8 seconds after head to wind. Boatspeed recovery; 70 seconds. Widest angle (on new tack) 39° at 45 seconds. 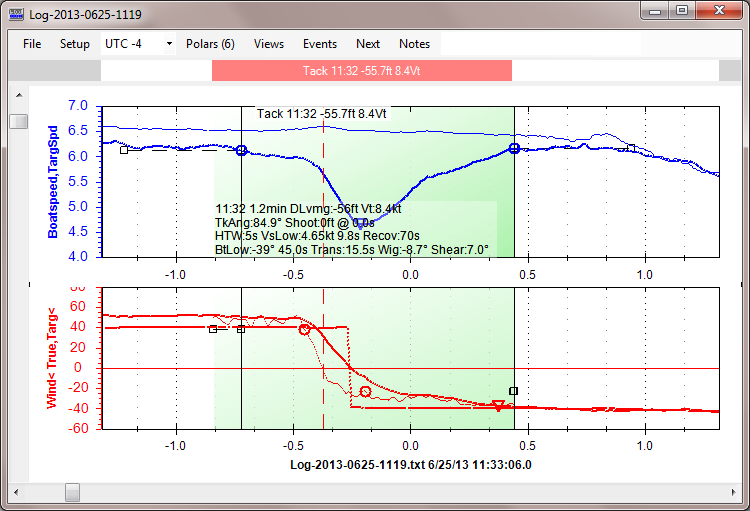 Transiton (time from pre to post tack wind angle) 15.5 seconds. Wiggle (change in wind direction, i.e. miscalibration) 9°. Shear (difference in true wind angle) 7°. Boatspeed was less than target pre-tack, even though the true wind angle was greater than target. Post tack looks OK. Could be sail trim issue. Boat began to slow before the tack started. This is not good. The boat didn’t go slightly wide of target angle on the new tack (in order to accelerate more quickly). In fact, it stalled out for a bit before finally getting to target angle. This reduces the acceleration and therefore extends the time before the boat gets back to speed.